From the A Kid’s Heart website, this is another Christmas tree decorating game. 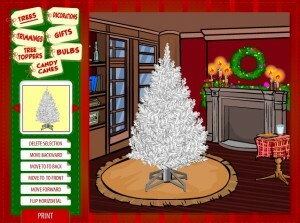 In this one you can choose the type of Christmas tree that yoy want to decorate. The tree can be decorated with candy canes, bulbs, gifts, decorations, trimmings and tree toppers. All decorations can be resized and rotated. Finally, the decorated tree can be printed.